I'll be the first to tell you that I'm no big fan of wrestling. I just can't get pumped up at the prospect of two muscly, angry-looking, sweaty boys/men sticking their testicles in each others' faces. So the human interest element of a wrestling story really has to involve me, or else the appeal is lost on me. Well, "The Hammer" is no Aronofsky's "The Wrestler," but it still manages to be a pretty appealing 'underdog' story, sans "The Wrestler"'s devastating ending. Now inspirational underdog pic can be great "Billy Elliot," good "The Fighter," or just mediocre ("Front of the Class,") and "The Hammer" falls somewhere in the middle category. 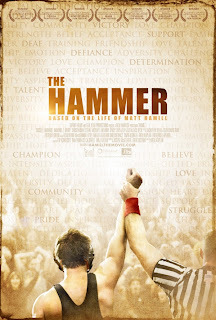 Based on a true story, "The Hammer" follows Matt Hamill, a deaf athlete (played by Russell Harvard, who has the disability in real life,) who struggles throughout his youth for love, inclusion, and acceptance. As a child, Matt's grandfather Stan (Raymond J. Barry) denied him the right to learn sign language or participate in a school with other deaf children. So guess what? Matt gets moved to the 'slow class' of a mainstream primary school, where the normal kids assume he's stupid- he can't hear, he can't talk, he doesn't respond to their taunts... until one day he does respond, knocking one of his victimizers to the ground after being bullied. Matt grows into a strong, oxish youth who nevertheless remains tentative about social engagements. He also finds his calling in life... wrestling. When Matt fails at his wrestling scholarship, partially because of his inability to understand sign language (way to go, Gramps,) he must fight his fears and insecurities in order to achieve his dreams. I'll admit- I kind of spaced out during the wrestling scenes, which weren't my forte. But despite the sentimentality, the tears, and the token inspirational moments, I was pleased with this film as a whole. It wasn't really anything new or special, but it was well-done. First of all Matt was a likable characters- you felt for his failures, even if you knew he was going to succeed at the end. The Grandpa was a three-dimensional character, even if his motivations were not always clear. He made up for his shortcomings by by an overall good father figure to his grandson. Matt's deaf girlfriend Kristi (also deaf actress Shoshannah Stern) was kind of blah... you couldn't really feel the chemistry between her and Matt, and her constant nagging at him to sign rather than speak was annoying, and never really got resolved. 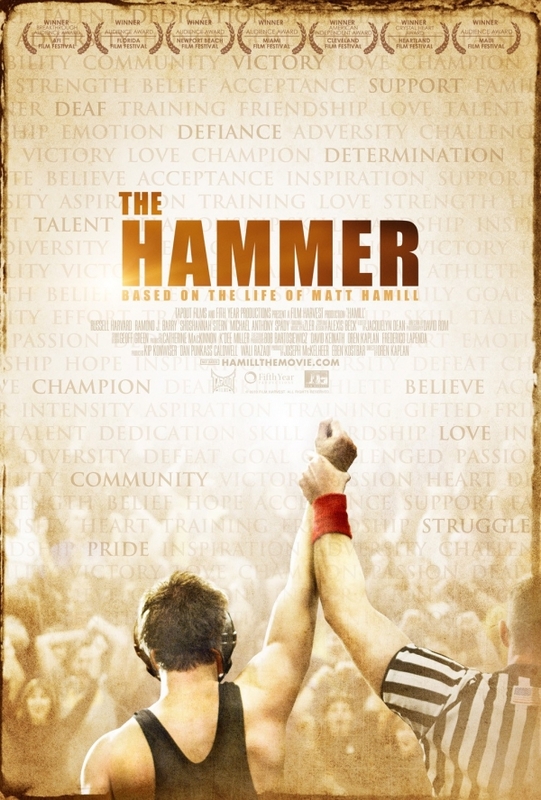 "The Hammer" is an overall rather predictable movie that ends up inspiring you despite yourself. The acting is decent, the script strong, and the characters likable enough. It might be worth a watch if you can find it for a cheap rental, or if you like this sort of movie.